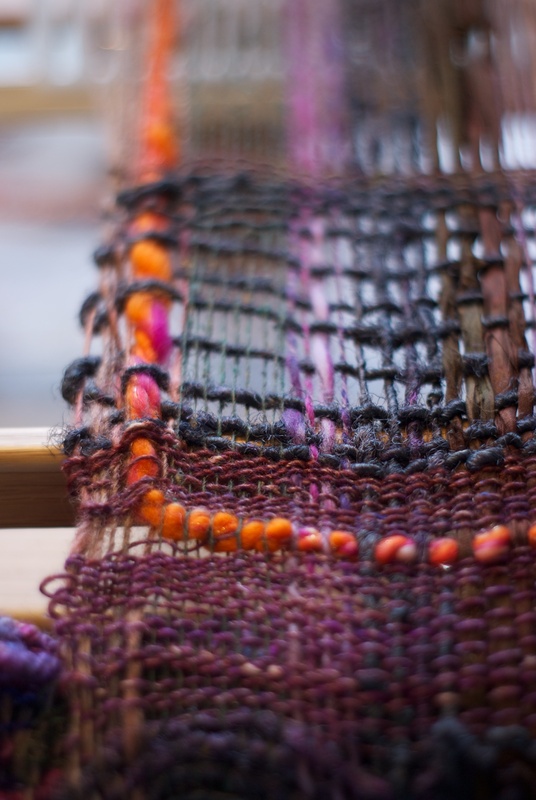 Its been a little while now since I discovered weaving as a new obsession creative pass time. Since then, my house has become a repository for random cones of yarn, baskets of mini skeins and odds and ends off my bobbins. The boys from Belgium (Bart and Francis) with their amazing supply of beautiful, weird, and wonderful threads, keep moving to the top of my ‘shop there’ list, and yep, I have already collected two looms. I remember when I got the first, my beautiful Saori loom, the woman I bought it from (thanks Patty!) told me at the time that it was the first of many. I didn’t believe it. However.. she was right. 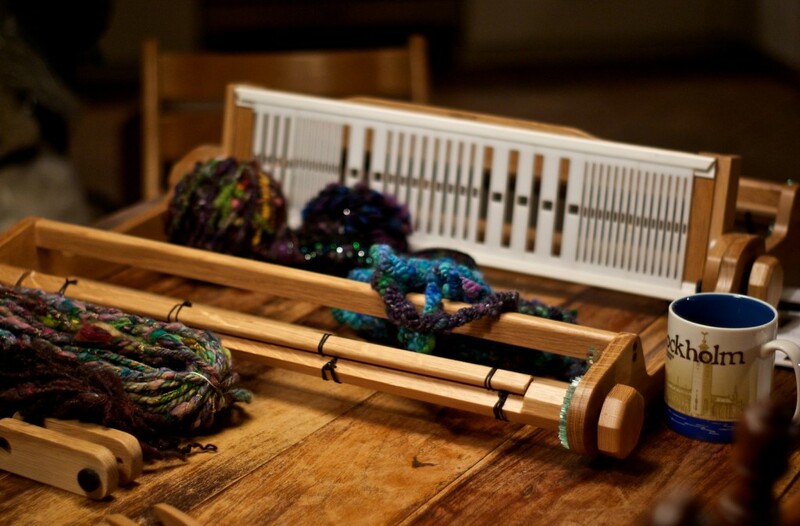 I love weaving on my Saori loom, its a floor loom, it has treadles, two shafts, very simple and is very smooth to use. But it soon became obvious that it had some limitations that I began to find a bit well… limiting. I wanted to get away from having everything in stripes across the fabric, clasped weft, with its pointy spikey look didnt really interest me, I wanted to let the art yarns free to dive along the length of the fabric, to give them some room to stretch out rather than trying to confine them in relatively short backwards and forwards rows. So Pattys prediction came true. For the last couple of weeks I have been using my second loom, the Majacraft Dynamic Heddle, and its doing just what I had hoped, its letting me spread the yarns I want to really see all of, out along the warp. I can do this with it because of the different sized dent segments, some big enough to carry all sorts of crazy yarns, and then I can move mix and match these segments in the heddle. I dont need to tell you how cool this is, it really opens up a lot of possibilities for warping and the materials you can use. In my most recent warp I even added in strips of sari silk, and in previous weaves I have used coiled and bobbly yarn with no troubles at all, even a big puffy thick and thin single survived its weaving journey with no adverse effects! I was also able to do stuff like this, adding in a bulky yarn to the weft then carrying it up with the warp, through a dent and weighted on the other side to weave it into my design. Then when I had enough of that I brought it back into the weft again. I also found out I could actually remove dent segments during weaving, and flip them, for a pretty twist effect. My favourite one though is from simply moving the segments apart for a while, its gives a really nice shape to the weaving! Another thing I like about using the loom is the magnetic attachment of the heddle to the loom, it does make it pretty easy, and really, I just like the idea of magnets anyway. Magnets rule. What has been most interesting for me though, is discovering that each loom has its own character and how differently that means I work on them. On the Saori loom I am working with a rhythm, a lot more like spinning I guess, hands and feet, and thats when I really enjoy actually just the very plainest weave, making the more fabricky stuff, I dont want to interrupt it to fiddle around with what I am doing. However on the Majacraft loom its almost the opposite, I find myself taking much longer with the weaving, not because it is slower, but because I am just using hands not feet, maybe. Its a more thoughtful, more creative process for me, and I am doing a lot more experimenting with the threads and consciously forming patterns. There are also of course, more possibilities for creating variation in the weaving with this loom too, so those ideas are in my head as I am working on it, as constant potentials and ‘what if’s. This was something I had not expected! But I have to say I am enjoying the thinking part of the process very much. Something that makes this an easy loom to use is that I can use the direct warping method to set it up. 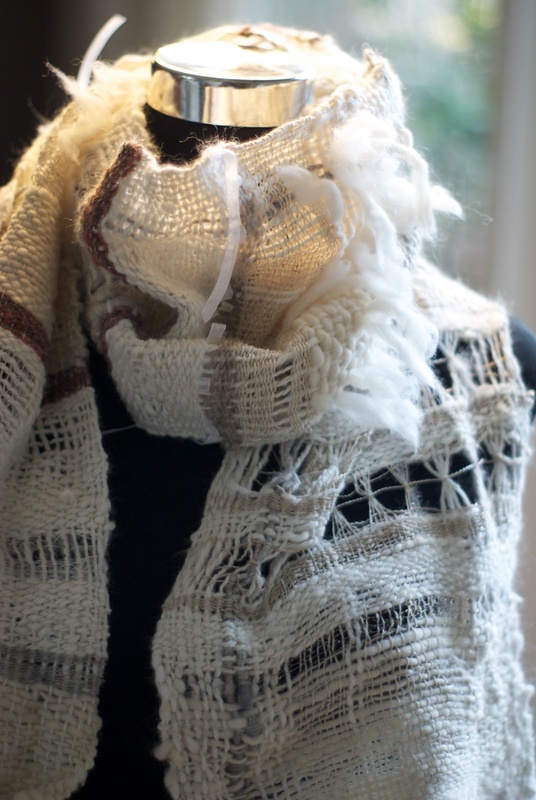 This is surprisingly fast and simple, especially when you are doing it as a freeform weaving. I am totally no expert in setting up looms, but I think it takes me between 20 and 40 minutes to get the loom ready to weave, depending on which warp threads and dents I am using. I often get people asking me about how to do the warping and if its difficult or not. That was also one of the things I was worried about when I started with weaving, I always had the idea it was pretty complicated and time consuming to get your warp made and threaded, but now I have discovered this way of doing it, unless I want a much longer warp, I don’t actually see a good reason for doing anything different! I made a video, showing you how simple this is to do, setting up the Dynamic Heddle loom start to finish. Of course this is not the only way to put a warp onto your loom, but I am finding no compelling reason to do it otherwise at the moment, although I am still pre-winding for my Saori. 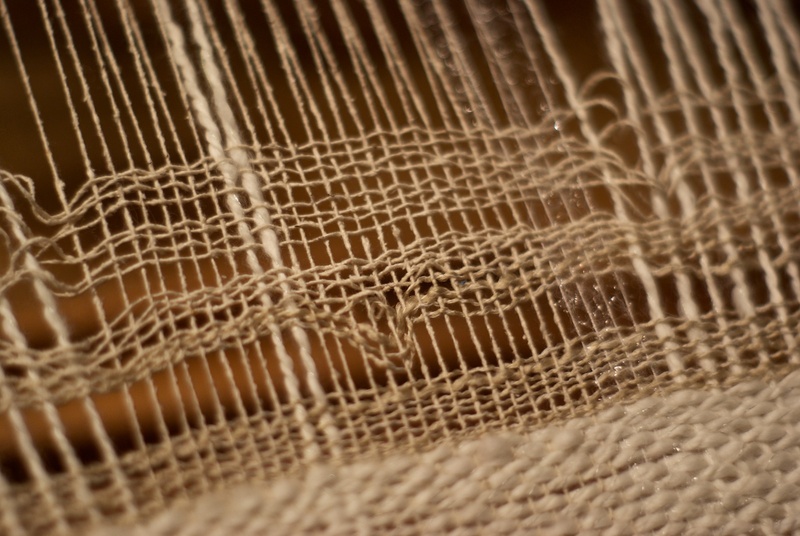 I find that creating a long enough warp for single projects is so quick and easy, I don’t have time to get bored with my warp threads, and I can really easily move from one project to the next. I made a video for you so you can see how I do the warping, I hope you enjoy it, because in fact its such a simple project I was worried the video would actually just be a bit boring! But anyway, let me know if you try this and have any questions, in case I missed something. You make some lovely items. A suggestion would be to put a weight on the warp threads while winding on. Maybe a piece of wood wrapped in cloth would hold the tension and free up your hands while you wind on. aha thats a great idea! My ‘other’ pair of hands was holding the camera and also isnt always here on call, so I will for sure weight the warp threads next time, thank you!